Airtel Nigeria has unveiled Smart Speedoo , a new data plan which most internet-savvy Nigerians are taking with mixed feelings. For those asking how does Smart Speedoo work, it allows customers to experience real data while browsing at affordable tariff and enjoying free megabytes. Interested subscribers can activate the new internet package by dialing *141# on their devices. Vice President, Data & Digital Services at Airtel, Nitin Anand, explained how the Airtel Smart Speedoo plan works. “When a customer uses up to 10mb at1kobo/kb, Airtel gives him 10mb free. And when his usage gets to 50mb, the browsing rate drops to 0.5kobo/kb, then he gets 50mb free. When the customer’s usage reaches 100mb, the rate drops further to 0.2kobo/kb and he is given 100mb free,” Anand' explained. On their normal plan, Airtel gives 10 mb for N100, you recharge and subscribe and the money is gone. But with Speedoo,ppens, when you activate it, you load your recharge card, you can use the credit both for data and calls, however any time you use data up to 10 mb, you get another free. So in the first instance, what is happening here is that you get 20 mb for N100. Since 1kb is 1kobo, 10mb (10,000kb) will cost 10,000 kobo. That's ₦100 (10,000 ÷ 100), which means N100 gives you 10,000kb ie 10mb, then you are given another 10mb bonus. If you want to take it further, you use another 50mb which would cost you N500 at that rate to get the rate reduced by half, so after spending N500 for 50 mb, you then spend another N500 to get 100mb (normal 50mb + bonus 50mb). Then that 100mb you get gives you another extra 100mb. 50 + 100 + 100 = 250mb approximately for 1k. That, my friend, is what Airtel organised a ceremony to launch. Airtel further confirm that this cycle continues every month, thereby giving Airtel customers the FREE SURF experience. Airtel’s Head of Data & portals, David Umoh added that Smart Speedoo gives pop-up notifications to show usage. Hence users of the service do not need to remember USSD code to buy data or worry about their airtime being used up when browsing. 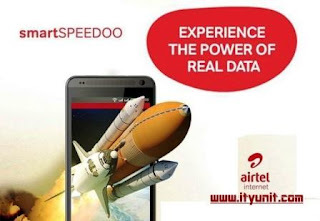 Airtel also noted that Smart Speedoo gives ‘free internet in everyone’s hand’ as it enables customers to be in control of their data usage while also surfing at a very low pay-as-you-go payg rate. It promised to continue to roll out more services to further empower Nigerians and offer the free surf experience. Smart Speedoo rides on the superfast 3G internet, which offers internet speed of up to 42mbps. This speed is very close to the Long Term Evolution (LTE) speed. To opt out of Airtel Speedoo, just call customer care on 111 and request to deactivate. nice plan. ntel is still joking with that 9000 naira they are asking us to pay.